Location: Thiers, in the Cantal departement of France (Auvergne Region). 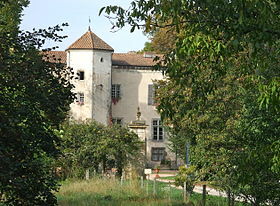 Notes: The castle of La Chassaigne is a manor located in the town of Thiers in the Auvergne-Rhône-Alpes region.The medieval castle from the end of the fifteenth century was transformed in the eighteenth century. In 1728, the Marquis de Simiane, new owner, had it restored and enlarged the park. During the Revolution, the Montmorins (paper makers) knocked down the towers. In the twentieth century, the castle lost part of its woodwork. The chapel, at one end of the gallery, has wall paintings from the Gothic period to the eighteenth century. On the second floor, a room conserves its paneling of Louis XIV.